If you’re around my age, you might remember a series of specials that brought our favorite Sesame Street Muppets and a bunch of Jewish celebrities that probably meant nothing to you as a pre-schooler (Itzhak Perlman?!?) visiting their Israeli counterparts on Rechov Sumsum in a mash-up known as Shalom Sesame. Depending on when you encountered these videos and how good your memory is, you might either feel warm nostalgia or faint embarrassment for the attempt to teach American Jewish kids Hebrew language and Israeli culture through the quick-cuts and funny bits Sesame Street is known for the world over. Does every person have the capacity to hate? Does every person have the capacity to love? These questions are at the heart of Cherry Docs, a provocative play by David Gow on stage at the New Repertory Theatre in Watertown. The play tells the story of Danny Dunkleman (Benjamin Evett), a secular Jew from Toronto whose job as a public defender lands him on the case of Mike Downey (Tim Eliot), a skinhead who has killed a Pakistani man. When we meet both men, they are full of (self-)righteous anger. Mike is angry at the world for the crummy hand he’s been dealt in life as a poor, uneducated white man who can’t hold down a job. Danny is angry that such men as Mike exist, although his commitment to liberal ideals of justice for all keep him on the case. Despite having every reason to hate each other, Danny sees potential in Mike’s intelligence and challenges him to rise to his own defense. Danny in turn respects that Mike treats him as a human being and not simply an embodiment of skinhead ideology. While the men certainly don’t become friends, Evett and Eliot portray a nuanced courtship of sorts that makes their mutual seduction totally believable. 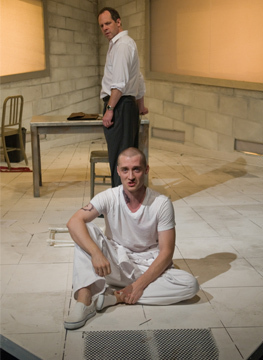 Confined to one small, claustrophobic set (designed by Jenna McFarland Lord), director David R. Gammons’ staging emphasizes the ways in which hatred (and the prison system) can rob individuals of their humanity. Eliot stalks his cell like a caged lion, and in a climactic moment, Evett takes on the role of a lion tamer at the expense of a folding chair. For all its simmer — and there’s plenty — the play lost me at the climactic moment. I won’t spoil it for you, but when Mike, having come to the brink of renouncing his skinhead philosophies, collapses back into a rant about the Zionist Occupation Government, Danny reacts in a way that, to this Jew, felt totally improbable. Despite my inability to accept the pivotal moment in the show, I found a lot to like in the production. Most importantly, a week after seeing it, I’m still thinking about the questions it raises. In a world where issues of discrimination and racially-based recriminations still make headlines every week, it’s important to step back and ask ourselves where we fit in the equation of love and hate. Cherry Docs reminds us that we may be surprised to find the answer. Cherry Docs is playing at the Arsenal Center for the Arts, Charles Mosesian Theater, 321 Arsenal Street, Watertown, MA 02472, through November 7. Tickets are Full Price $28-$58. Seniors $7 off full price. Student rush $14. Call: 617-923-8487 or buy online at www.newrep.org. There are free post-performance discussions following the evening performance on October 30th and matinée on October 31st.